With Christmas on the way, you’re probably wondering what you can possibly buy for a busy teen. Well, take a look at this list because we have the most fabulous gift ideas, from ‘edgy’ shirts to hilarious personalized suitcase covers and even funny troll socks, we’re sure to have something she’ll love. Remember all the good times spent hanging out with your friends with this quirky couch guestbook. With neat prompts, everyone can fill out the fun stuff you all got up to, how long they stayed, things found behind cushions, and even rate their stay on the report card – let’s hope you get good grades. 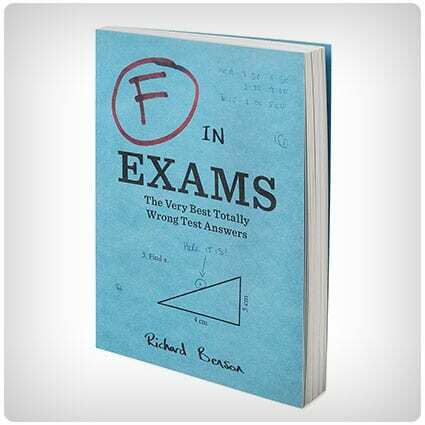 Release some of the stress from exams with this wacky book; F in Exams. 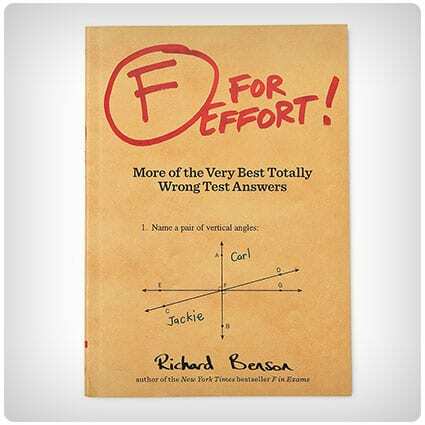 Instead of tips and tricks, these pages are full of hilarious real wrong answers that American and British students have given in their tests. Just remember not to take a leaf out of their book. If you have a friend that’s off to uni and you’re looking for something for them to remember you by, then Mushions are exactly what you’re after. These cushions are personalized with your selfie! Whether it’s a funny face or a cheesy grin, she’s sure to love giving it a squeeze when she misses you. Take a piece of passion with you wherever you go with this ‘deep pan-tastic’ A Pizza my Heart necklace. Made with brass, the pendant features not your usual pepperoni toppings, but adorable heart shapes instead, making it the perfect gift between pizza loving friends. The pendant is presented on a gold fill chain. Called a ‘wrap’ on your busy day? Then it’s time to roll up and relax with the burrito blanket. No other blanket will have you feeling quite as toasty that’s for sure, with it having a whopping 5-foot diameter. Why not grab yourself a mate and create a double-layered filling? Well, it’s safe to say there’s not a single chance of getting your luggage mixed up with another person’s when you use a FIREBOX Head Case. 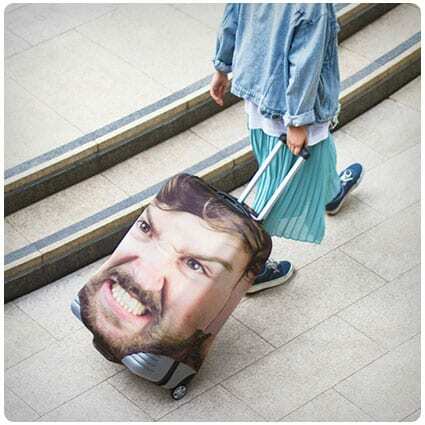 These wicked suitcase covers are custom printed with a selfie of your choice, be it yours, a friend’s or maybe even a fav celeb’s? Travel in style. We’ve all longed to see what we would look like as mini-figures and now you can personalize your own with Brick Yourself. Customize your figure by giving them the typical outfit you wear and your fav hobbies, then they do all the rest. Or why not go all out and get the whole family made? Have you got a soft spot for those furry-headed troll dolls from the 90’s? Have your feet feeling funky with these fabulous socks. Each pair features an adorable troll, with its colorful wild hair growing over the top of the sock, free for everybody to see. Get the smile every SoundCloud rap artist has ever wished for with these cooler than cool grillz. Follow the instructions to find out how to use the included silicone molding bars to fit them to your mouth. These grillz are in a yellow gold-tone color, giving you the look all the top celebs sport. Play beachball like you never have before with this gigantic Beach Behemoth inflatable ball. When Sol Coastal says giant they mean it, no other ball compares! Being 12-foot pole-to-pole, it’s safe to say you’re going to need a lot of puff to blow this one up. If there is one thing all teenagers are good at, it’s napping, without fail. Celebrate their sleeping achievements with the ‘good at naps’ graphic knit throw – it’s perfect for using as quirky bedroom décor, or wrapping themselves up in once the inevitable tiredness creeps in after a long hard day of exams. ‘I could pee on this’ is a clever poem book all about how our lovable felines think. If she owns a cat or two, this read is a must-have, with most if not all of the amusing poems ringing true. No doubt you’ll hear her chuckling away as she makes her way through the pages. Is there anything funnier, or cuter, than a pet pooch wearing a collar of shame? If this is a sight that makes your teenage daughter chuckle, then this lamp is definitely for her. Made from wax-polished oak, this little pup is sporting a linen lampshade to represent the collar, giving her both light and laughs in equal measures. 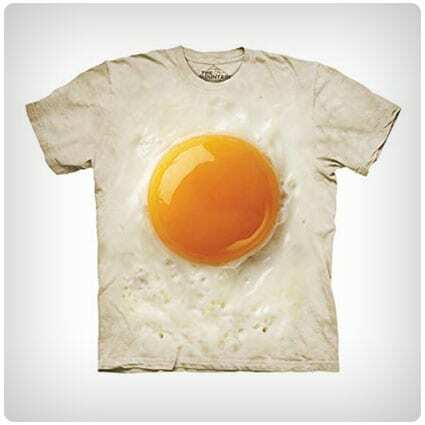 If your teenager is always sunny side up, then celebrate her happy disposition with this awesome t-shirt, which shows a huge fried egg in all its glory. Available in sizes small to 5XL, this t-shirt is also great for teenagers who prefer to be moody, because then the ‘yolks’ on them! Dino fans are going to love this unusual dinosaur patch, which features a picture of the mighty T-Rex with an asteroid flying overhead and ‘never forget’ embroidered underneath. Attaching the patch is easy – simply iron on anywhere you like, a jacket, a favorite pair of jeans or even your school backpack. Who knew your poop could tell you so much about what’s going on inside your body?! It may sound like we’re talking crap, but Josh Richman and Anish Sheth have all the fascinating facts right here inside ‘What’s your Poo Telling You’. Your next toilet trip will certainly make for an interesting one. Fed up of people touching your stuff? Use these gross looking chewed-up bubble-gum magnets and you’re sure to put any nosy parker off the goods. Available in a variety of ‘flavors’, they’ll have your locker, fridge, or anything metal looking like the gag-worthy underside of a cafeteria table. The Face Bank is one of the more unusual (dare we say creepy?) money banks from Takada Collection. 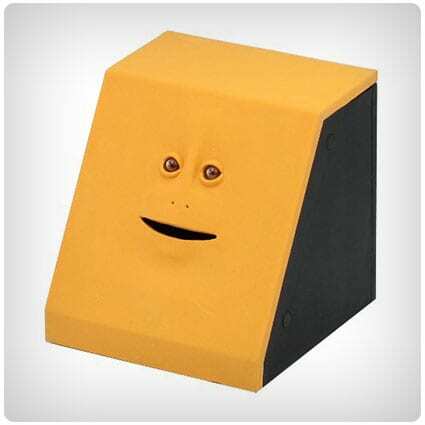 Featuring a yellow visage, this bank will gobble up your cash through its mouth, and then hold on to it until you are ready to access your money through the opening in the bottom. Cold feet may well mean a warm heart, but nobody will feel the love when their feet are like blocks of ice. Get them nice and toasty with these unique slippers which look as though they’ve just come out of the oven. Every teenager who suffers from the cold ‘kneads’ a pair of these! There’s nothing as weird as ‘yolk’, although this stress toy comes a pretty close second. Squeeze the egg toy to make it puke out slimy yolk, before watching it greedily slurp it all back up again! If your teen enjoys the grosser side of life, they’ll adore this. Teenagers aren’t renowned for always being the most fragrant of humans, although girls do tend to fare better than boys. 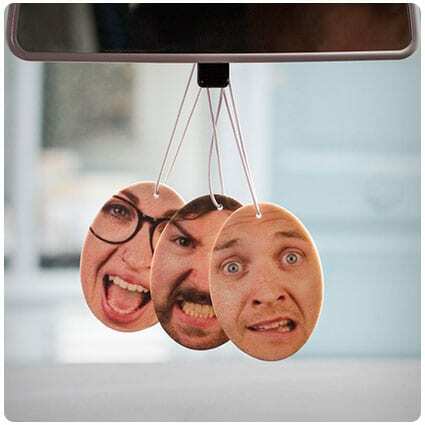 Keep their car smelling fresh, at least, with a Fresh Face Air Freshener. More than just a smelly, you can have any picture you like printed on, and it comes in five fragrances, including…bacon? Cables can be the bane of anyone’s life, but kids seem to have more than most thanks to their ever growing collection of electronics. Cable Bites are adorable little animals which clip on to the tip of a cable, making them both super cute, AND easy to locate. Sometimes you just need an instant pick me up, and for those times when you don’t have access to funny cat videos, memes or a tacky dad joke, this emergency clown nose sure gets you giggling. Simply unscrew the jar, pop it on your nose, and the laughs will never end. Here kitty kitty; keep your paws nice and warm with these super fluffy plush gloves – winter has never looked so cute. Being fingerless, they can be worn whilst shopping, walking your dog, on the way to school or just chilling out with friends, could they be any more ‘purrfect’?! From the author of ‘F in exams’, we have ‘F for effort’, another in the wrong yet seriously funny test answers series. Great to have as a pick-me-up for when exam stress is getting you down, or you just need a little break in between revision sessions. Have your classmates in tears when you whip this silly nose-shaped pencil sharpener out of your bag. Just the right amount of gross, this nose sharpener is exactly what teens go crazy for. With pencil-shaving boogers, even the sternest of teachers won’t be able to resist sniggering. Save those pennies with this super cool 2-ingredient DIY lip gloss. These lip glosses are not only cheap, but they really do keep your lips feeling plump and moisturized while giving them a cute hint of color and shimmer. All you need is a clean container, un-petroleum jelly and pearl dust. From Lydi Out Loud we have these awesome unicorn fizzy bath salts. Keep them as a treat for yourself or place them in the jar, use the pretty printable label and you have a cute DIY gift for a friend! Perfect for anyone who loves a touch of luxury or adores everything unicorn-themed. Keep your fins shiny, smooth and moisturized with this fabulous DIY mermaid body scrub. 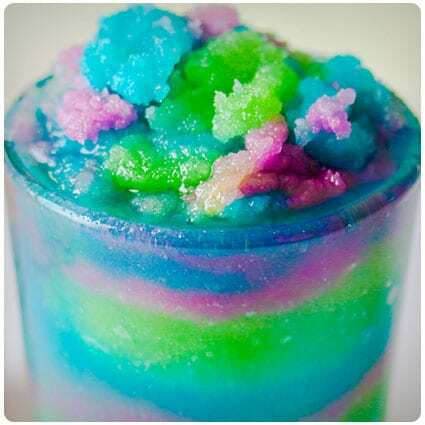 Requiring just a few supplies, this colorful body scrub makes for a fun rainy-day activity to keep your teens busy and away from the TV screens. It looks so great they’re going to want to try it out straight away. Hit the right note when getting a present for today’s teens by reaching into this list of techno items that will stimulate and integrate into their everyday living. Hi-tech but also eminently useful, these items will delight your electronic explorers.